I carried her safely to Bethlehem town. "/ "I," said the donkey, shaggy and brown. And here we are again. Another donkey. This time bearing Jesus through Jerusalem. Cheering crowds line the street. Cloaks are spread and branches waved. And the "vehicle" that made it possible was the donkey who carried Jesus in fulfillment of scripture. Was it a party atmosphere? Was it a solemn occasion? Two very different pieces of art paint two very different events...and two very different donkeys. Hippolyte Flandrin's nineteenth-century painting of the subject shows a very balanced, almost rigid event. Strong horizontals (the road, the top of the crowd of heads, the city architecture) are perpendicularly counterpointed by strong verticals (Jesus' body, the crowd of people mostly standing upright, the palm branches, the vertical lines of the city wall). There is balance and measure. It is hard to imagine this crowd shouting anything as they stand so politely, watching Jesus ride by. The donkey echoes that balance with strong vertical lines (legs) and strong horizontal lines (back). Accompanied by the colt, the donkey walks in measured step. The pace is surely slow. Jesus stares directly ahead, focused on the future. Surely his mind is filled with understanding of what he is riding toward. Jean-Hippolyte Flandrin. 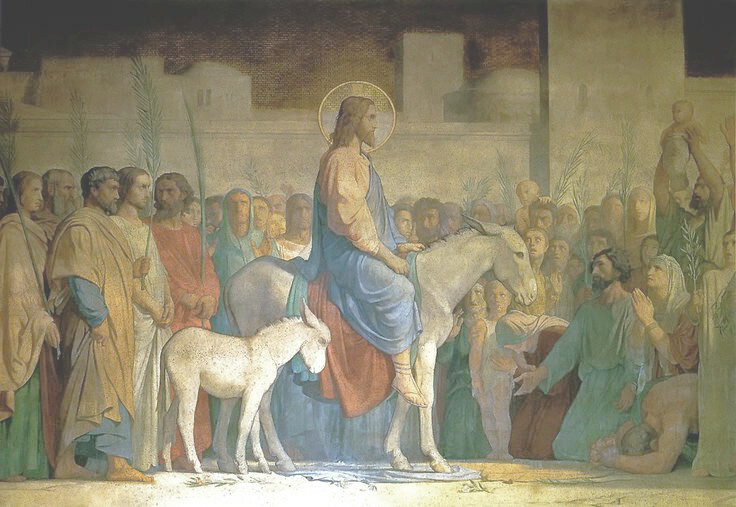 Christ's Entry into Jerusalem.c. 1842. Fresco. Paris: Church of St. Germain des Pres. Which is why the manuscript illumination below offers such a contrast. Where Flandrin's understanding of Christ's entry into Jerusalem is one of balance and measure, the illustrator of the Armenian gospel book uses curves and contrast. The colors of the illustration are vivid and saturated. The vertical lines of architecture are minimized, and the vegetation is made of wavy, curvy lines in the leaves and branches and trunks. Even the ferns growing at the base of the center tree have curved ribs and fronds. Garment fabric collects in curves and falls in folds. One young parade-goer is spreading his garment in the street...and it isn't an outer garment. It's the whole outfit! People are waving, and hands are clapping. Complementary colors (red and green, especially) add visual life to the scene. Very unlike Flandrin's version. 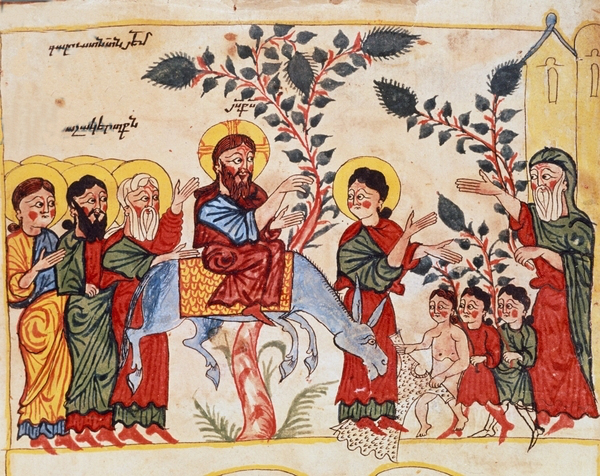 Entry of Jesus into Jerusalem, miniature from Armenian gospel, folio 7 verso. Armenian Museum, Isfahan, Iran. But it may be the donkey that is the most different in the two versions. In the manuscript illumination, Jesus - riding sidesaddle - is on a bucking bronco of a donkey. All four of the donkey's feet have left the ground. 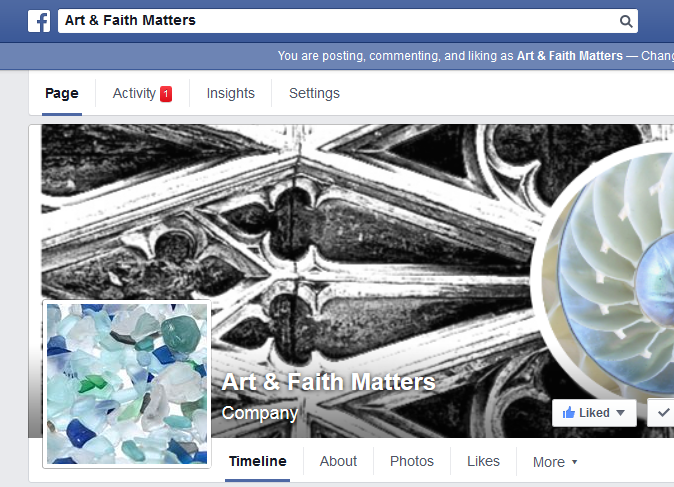 The placement of the tree and the donkey with all four feet off the ground might even bring to mind a carousel horse (thanks to my friend Amy for that insight...and check the Art&Faith Matters FB page later in the week for more information on that). The top line of the donkey's form creates a C-curve. The front two legs are also C-curves while the back legs are double-curved. The idea of the Messiah entering Jerusalem riding a donkey may have been foretold in scripture, but it appears that no one asked this particular donkey! Jesus, of course, is up to the challenge. He gives an almost "Look, Ma, no hands!" gesture (not that there are any reins in sight, to be honest). And how would you describe the expression on Jesus' face? It is a completely different picture of the events of the day. Perhaps you've never considered that Jesus had this kind of ride through Jerusalem. I hadn't before seeing this picture. I had always imagined that the animal carrying Jesus did so with the decorum appropriate to his rider. But maybe not. Perhaps the bucking donkey with a mind of its own helped Jesus remember the stubborn, willful people for whom he came to earth in the first place. 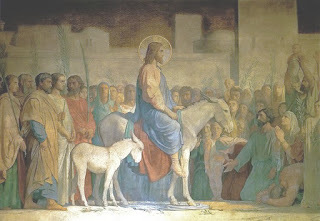 For additional thoughts on Jesus' "triumphal" entry, click here. For additional thoughts on the palms, click here.